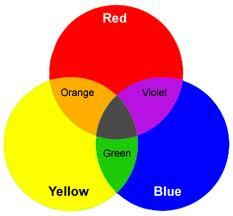 The Primary Colors (Red, Yellow, and Blue) are the hues that can not be created by mixing any other colors. They are the root of every other hue. By adding white, black, or grey they can be turned into Tints, Shades, or Tones. 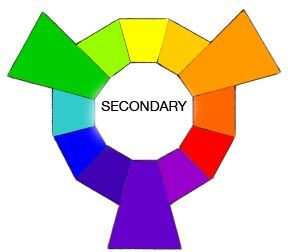 By mixing any two of the Primary Colors three new offspring are created: Orange, Violet, and Green. When you mix the Main Colors with their offspring six new colors emerge: yellow-orange, red-orange, red-purple, blue-purple, blue-green, and yellow-green. Historically there has been a confusion between the behavior of light mixtures, called additive color, and the behavior of paint, ink, dye, or pigment mixtures, called subtractrive color. This problem arises because the absorption of light by material substances follows different rules from the perception of light by the eye. A second problem has been the failure to describe the very important effects of strong luminance (lightness) contrasts in the appearance of colors reflected from a surface (such as paints or inks). For example, a strong light contrast between a yellow paint and a surrounding bright white paint makes the yellow appear to be green or brown, while a strong brightness contrast between a rainbow and the surrounding sky makes the yellow in a rainbow appear to be a fainter yellow, or white. Hue (e.g., red, orange, yellow, green, blue or purple). Thus, the visual impact of "yellow" vs. "blue" hues in visual design depends on the relative lightness and intensity of the hues. Previous to the 1930s, the models adopted in progressive color teaching tended to derive from Post-Impressionist models, notably the work of Vincent van Gogh, Paul Cezanne, and the later work of Edgar Degas and Claude Monet. The Bauhaus school, founded in 1919 by Walter Gropius in Weimar, was dedicated to the idea of creating a 'total' work of art in which all arts, including architecture would eventually be brought together. Paul Klee joined the staff in 1922 and taught there until the spring of 1931. Germany had been ruined by the war, humiliated at Versailles, the Social Democrats had taken power in the name of socialism and revolution was seeping in from the Soviet Union. Against that background Walter Gropius, dubbed the Silver Prince by Klee, wanted to start from zero, nothing short of recreating the world. The Bauhaus, which was at once a school, workshop, studio and laboratory, where teachers and students would forge a new alliance between art and industry. The machine was considered a positive element, and therefore industrial and product design were important components. There was no teaching of history in the school because everything was supposed to be designed and created according to first principles rather than by following precedent. Simple would equate to beautiful and the mantra was worker housing (sing: Walter Gropius, Walter Gropius, worker housing, worker housing). The 1930s saw the emigration of influential teachers and their students from the Bauhaus in Germany to the United States. One major exception was Klee, who returned home to Switzerland. 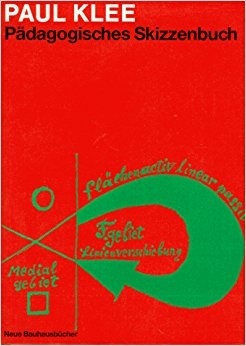 In the US new approaches which had been developed at the Bauhaus started to emanate from Moholy-Nagy's New Bauhaus in Chicago (1937-39) and influenced art schools throughout the US, as well Europe, by the 1960s. The Bauhaus style became one of the most influential currents of modern design and had a profound influence upon subsequent developments in art, architecture, graphic design, interior design, industrial design and typography. The Bauhaus architectural movement would lead the way in the creation of thousands of sterile, boxy buildings in the US and around the world. On the other hand, artist such as Klee, Kandinsky, and Feininger would have a more positive effect on the modern art movement. 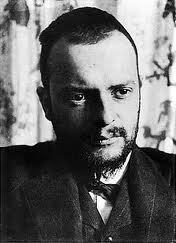 Paul Klee (b. 18 December 1879, d. 29 June 1940) refined his artistic and educational theories while teaching at the Bauhaus. The Paul Klee Notebooks, a collection of his Bauhaus lectures and other essays on art, are considered so important for understanding modern art that they are compared to the importance that Leonardo's A Treatise on Painting had for Renaissance artists. One critic claims Klee occupies a position in modern art comparable to Newton's in the realm of physics. Academic art since the Renaissance was based on the Aristotelian system of deduction from the broad principles of absolute beauty and a conventional color canon. Klee was devoted to the microcosm, to the smallest manifestations of nature. Through his inductive scientific exploration of color and the basic optical and structural order of nature, he was able to play a major role in the formation of the modern art movement. Klee was impressed with Paul Cezanne's use of color not merely to record the obvious visual appearance of objects (as the Impressionists had largely done) but to establish the artist's right to modify naturalistic coloring in order to harmonize or balance colors within the pictorial composition itself. Klee also noted that Cezanne appeared to show no embarrassment that his paintings revealed the manner by which they had been painted and that they had evolved over an extended period of time; Cezanne painted Mont Sainte-Victoire any number of times. For Klee this building-block approach to composition may have strengthened his own desire to produce works that placed more emphasis on formative powers than with the finished forms. 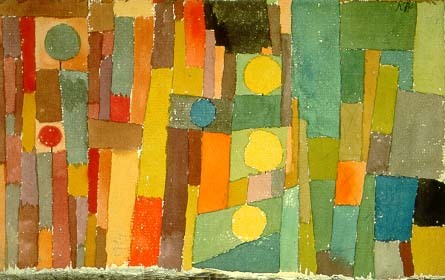 Like Cezanne, Klee was no natural painter. A second major influence stemmed from Klee's membership in the Die Blaue Vier (Blue Rider group), formed in 1921 with Kandinsky, Feininger, and Jawlensky. They lectured and exhibited in the US in 1925. Wassily Kandinsky, who later became his colleague at the Bauhaus, published a manifesto, On the Spiritual in Art (1911), in which color was cast in the role of the spiritual component of a visual and abstract language for the communication of feeling. Klee also had a fascination for paintings by Robert Delaunay which carry on a perfectly abstract existence without the benefit of motifs drawn from nature. Delaunay, experimenting with sunlight dispersed through prisms, inspired Klee to consider the question which confronted many artists of the time: when color is released from its descriptive role, what might be a basis or structure for in its application in abstract art? 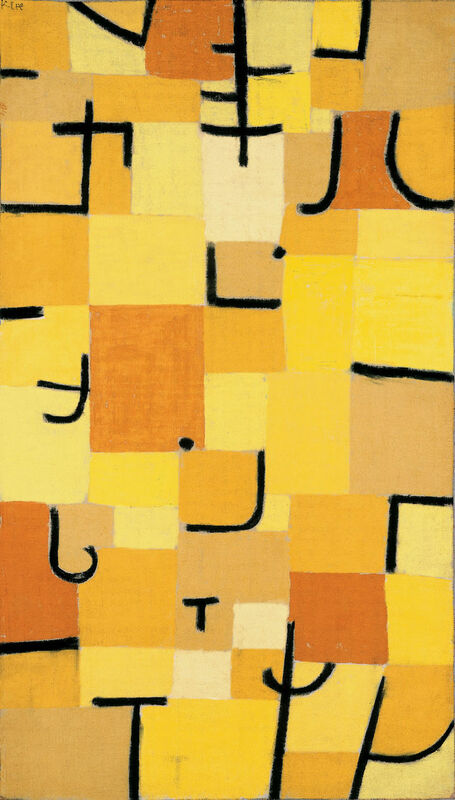 In 1914 Klee painted his first pure abstract, In the Style of Kairouan, (above) composed of colored rectangles and circles. The colored rectangle became his basic building block. Klee combined colored blocks to create a color harmony much like a musical composition. Moreover, his selection of a particular color palette emulates a musical key. Sometimes using complementary pairs of colors, and other times dissonant colors, reflecting the connection with music. Klee taught at the Bauhaus 1921 to 1931. 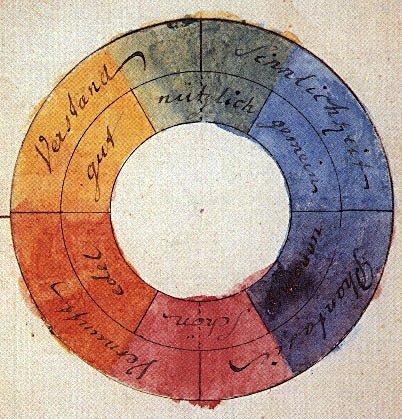 There he acknowledge respect for the 1810 theories of Johann von Goethe and charted an orderly analysis of color in relation to practical aspects of painting (specifically in the water color medium) and established a passage from the theoretical to the practical, so that simple formulas inspire experimental and open-ended possibilities. 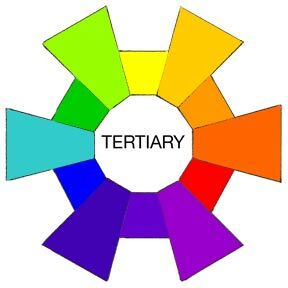 In order to obtain a useful teaching tool, he modified Goethe's six-section color circle (above), with red opposite green, orange-red opposite blue, and yellow opposite violet. Klee positioned his color circle to form a disc located horizontally within the color sphere. This three-dimensional arrangement permitted Klee to arrive at a useful organization of color in which white is located at the top of the figure and black at the base. 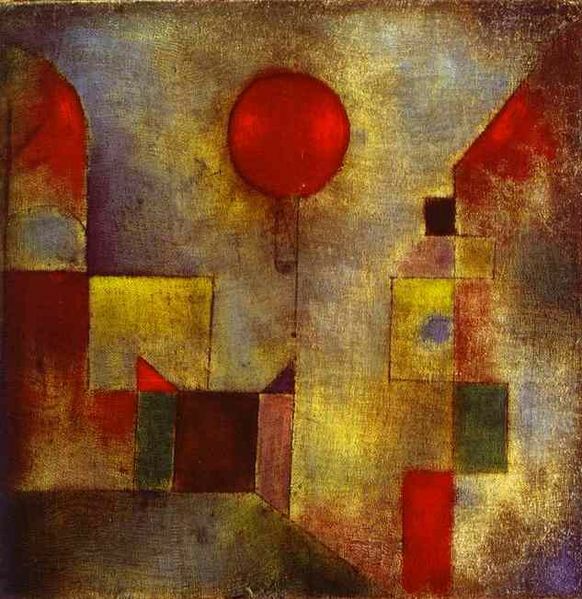 Importantly, it allowed Klee to clarify the relationship between hue, colorfulness (chroma) and tone (value). Having rejected traditional methods of pictorial representation, Klee set about seeking alternative strategies for holding his paintings together visually. A benefit of utilizing small selections of colors was that the resulting impression appeared unified and harmonious. A significant aim of his color experimentation was to produce a color foundation - the principal aim of which was to cross from the simple color exercise to the complex work of art. His strategy was not only to integrate drawing and painting, but also with considerations of form, composition, content, and pictorial imagination. Klee enjoyed the conflicting theories and opinions within the Bauhaus. Klee also taught at the Dusseldorf Academy from 1931 to 1933, and there came under Nazi scrutiny. His home was searched by the Gestapo and he was fired from his job. The Klee family moved to Switzerland in late 1933. His Ad Parnassum (1932. Oil on panel. 100 x 126 cm. Paul Klee Foundation, Kunstmuseum, Berne, Switzerland.) is considered his masterpiece and the best example of his pointillist style. He produced nearly 500 works in 1933 during his last year in Germany. However, in that same year, Klee began experiencing the symptoms of scleroderma. His output in 1936 was only 25 pictures. In the later 1930s, his health recovered somewhat, and in 1939 he created over 1,200 works. He used heavier lines and mainly geometric forms with fewer but larger blocks of color. His varied color palettes, some with bright colors and others sober, perhaps reflected his alternating moods of optimism and pessimism. In 1937, seventeen of Klee's pictures were included in an exhibition in Germany of "Degenerate Art", and 102 of his works in public collections were seized by the Nazis. He died in Switzerland, on June 29, 1940 and was buried at Bern, Switzerland. His legacy comprises about 9,000 works of art. 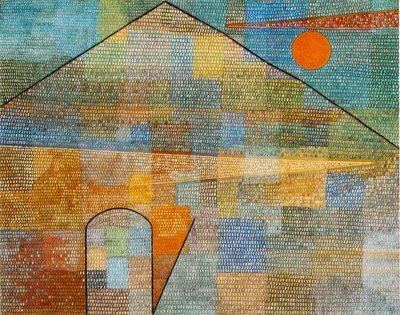 The words on his tombstone, Klee's credo, placed there by his son Felix, say, "I cannot be grasped in the here and now, For my dwelling place is as much among the dead, As the yet unborn, Slightly closer to the heart of creation than usual, But still not close enough." 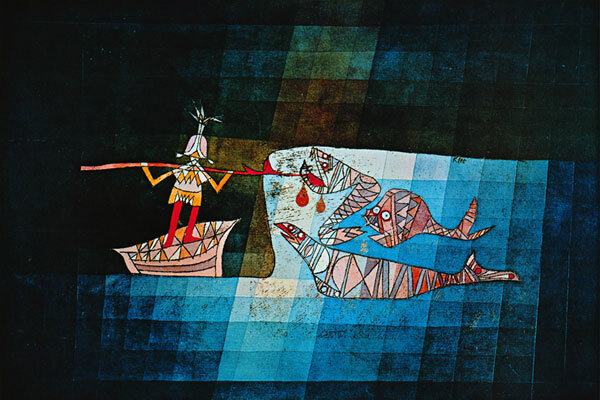 Paul Klee, Sinbad the Sailor, 1928 (Battle Scene from the comic-fantastic opera The Seafarer 1923); oil transfer drawing, pencil, watercolor, and gauache on paper on cardboard; 34.5 cm. x 50 cm. Kunstsammlung Museum, Basel. Note: In this piece I have only briefly dealt with Paul Klee's art relating to his work on the theory of color. Obviously there is much more to Klee. I have selected two more works, his mystical Angelus Novus and Poor Angel to, at least, hint at the breadth and depth of the artist.